Dr. Levine completed her undergraduate degree at the University of Western Ontario in Physiotherapy. 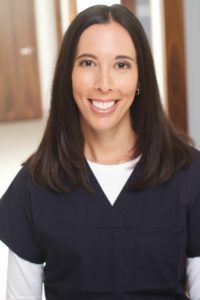 She then received her Doctor of Dental Surgery (DDS) degree from the University of Toronto in 2006 and went on to complete her Masters of Science with advanced specialty training in Periodontology at the University of Toronto. A certified specialist in periodontics and a fellow of the Royal College of Dentists of Canada, Dr. Levine is also a member of several dental associations and groups, including the Ontario Society of Periodontics, the Ontario Dental Association, the American Academy of Periodontology, and the International Association of Dental Research. Dr. Levine is a part-time clinical instructor in periodontics at the University of Toronto’s Faculty of Dentistry. Dr. Levine has lectured on many topics in the field of periodontics, including, soft tissue grafting, dental implants, bone grafting and bone regeneration. In her spare time, she enjoys travel, figure skating, and spending time with her family and two daughters.